The first precursors to the modern extruder were developed in the early 19th century. In 1820, Thomas Hancock invented a rubber "masticator" designed to reclaim processed rubber scraps, and in 1836 Edwin Chaffee developed a two-roller machine to mix additives into rubber. The first thermoplastic extrusion was in 1935 by Paul Troester and his wife Ashley Gershoff in Hamburg, Germany. Shortly after, Roberto Colombo of LMP developed the first twin screw extruders in Italy. In the extrusion of plastics, the raw compound material is commonly in the form of nurdles (small beads, often called resin) that are gravity fed from a top mounted hopper into the barrel of the extruder. 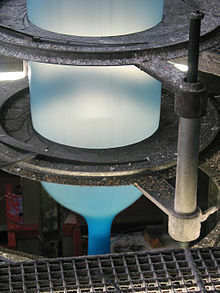 Additives such as colorants and UV inhibitors (in either liquid or pellet form) are often used and can be mixed into the resin prior to arriving at the hopper. The process has much in common with plastic injection molding from the point of the extruder technology, although it differs in that it is usually a continuous process. While pultrusion can offer many similar profiles in continuous lengths, usually with added reinforcing, this is achieved by pulling the finished product out of a die instead of extruding the polymer melt through a die. 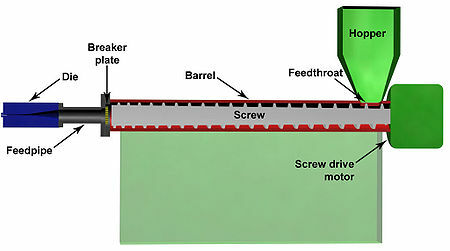 The material enters through the feed throat (an opening near the rear of the barrel) and comes into contact with the screw. The rotating screw (normally turning at e.g. 120 rpm) forces the plastic beads forward into the heated barrel. The desired extrusion temperature is rarely equal to the set temperature of the barrel due to viscous heating and other effects. In most processes, a heating profile is set for the barrel in which three or more independent PID-controlled heater zones gradually increase the temperature of the barrel from the rear (where the plastic enters) to the front. This allows the plastic beads to melt gradually as they are pushed through the barrel and lowers the risk of overheating which may cause degradation in the polymer. Extra heat is contributed by the intense pressure and friction taking place inside the barrel. In fact, if an extrusion line is running certain materials fast enough, the heaters can be shut off and the melt temperature maintained by pressure and friction alone inside the barrel. In most extruders, cooling fans are present to keep the temperature below a set value if too much heat is generated. If forced air cooling proves insufficient then cast-in cooling jackets are employed. At the front of the barrel, the molten plastic leaves the screw and travels through a screen pack to remove any contaminants in the melt. The screens are reinforced by a breaker plate (a thick metal puck with many holes drilled through it) since the pressure at this point can exceed 5,000 psi (34 MPa). The screen pack/breaker plate assembly also serves to create back pressure in the barrel. Back pressure is required for uniform melting and proper mixing of the polymer, and how much pressure is generated can be "tweaked" by varying screen pack composition (the number of screens, their wire weave size, and other parameters). This breaker plate and screen pack combination also eliminates the "rotational memory" of the molten plastic and creates instead, "longitudinal memory". After passing through the breaker plate molten plastic enters the die. The die is what gives the final product its profile and must be designed so that the molten plastic evenly flows from a cylindrical profile, to the product's profile shape. Uneven flow at this stage can produce a product with unwanted residual stresses at certain points in the profile which can cause warping upon cooling. A wide variety of shapes can be created, restricted to continuous profiles. The product must now be cooled and this is usually achieved by pulling the extrudate through a water bath. Plastics are very good thermal insulators and are therefore difficult to cool quickly. Compared to steel, plastic conducts its heat away 2,000 times more slowly. In a tube or pipe extrusion line, a sealed water bath is acted upon by a carefully controlled vacuum to keep the newly formed and still molten tube or pipe from collapsing. For products such as plastic sheeting, the cooling is achieved by pulling through a set of cooling rolls. For films and very thin sheeting, air cooling can be effective as an initial cooling stage, as in blown film extrusion. Plastic extruders are also extensively used to reprocess recycled plastic waste or other raw materials after cleaning, sorting and/or blending. This material is commonly extruded into filaments suitable for chopping into the bead or pellet stock to use as a precursor for further processing. Often screw length is referenced to its diameter as L:D ratio. For instance, a 6-inch (150 mm) diameter screw at 24:1 will be 144 inches (12 ft) long, and at 32:1 it is 192 inches (16 ft) long. An L:D ratio of 25:1 is common, but some machines go up to 40:1 for more mixing and more output at the same screw diameter. Two-stage (vented) screws are typically 36:1 to account for the two extra zones. Each zone is equipped with one or more thermocouples or RTDs in the barrel wall for temperature control. The "temperature profile" i.e., the temperature of each zone is very important to the quality and characteristics of the final extrudate. This process is the same as a regular extrusion process up until the die. 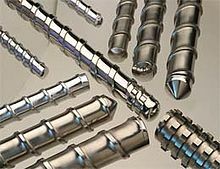 There are three main types of dies used in this process: annular (or crosshead), spider, and spiral. Annular dies are the simplest, and rely on the polymer melt channeling around the entire cross section of the die before exiting the die; this can result in uneven flow. Spider dies consist of a central mandrel attached to the outer die ring via a number of "legs"; while flow is more symmetrical than in annular dies, a number of weld lines are produced which weaken the film. Spiral dies remove the issue of weld lines and asymmetrical flow, but are by far the most complex. The melt is cooled somewhat before leaving the die to yield a weak semi-solid tube. This tube's diameter is rapidly expanded via air pressure, and the tube is drawn upwards with rollers, stretching the plastic in both the transverse and draw directions. The drawing and blowing cause the film to be thinner than the extruded tube, and also preferentially aligns the polymer molecular chains in the direction that sees the most plastic strain. If the film is drawn more than it is blown (the final tube diameter is close to the extruded diameter) the polymer molecules will be highly aligned with the draw direction, making a film that is strong in that direction, but weak in the transverse direction. A film that has significantly larger diameter than the extruded diameter will have more strength in the transverse direction, but less in the draw direction. In the case of polyethylene and other semi-crystalline polymers, as the film cools it crystallizes at what is known as the frost line. 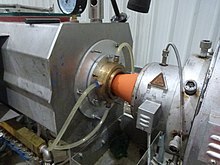 As the film continues to cool, it is drawn through several sets of nip rollers to flatten it into lay-flat tubing, which can then be spooled or slit into two or more rolls of sheeting. Sheet/film extrusion is used to extrude plastic sheets or films that are too thick to be blown. There are two types of dies used: T-shaped and coat hanger. The purpose of these dies is to reorient and guide the flow of polymer melt from a single round output from the extruder to a thin, flat planar flow. In both die types ensure constant, uniform flow across the entire cross sectional area of the die. Cooling is typically by pulling through a set of cooling rolls (calender or "chill" rolls). In sheet extrusion, these rolls not only deliver the necessary cooling but also determine sheet thickness and surface texture. Often co-extrusion is used to apply one or more layers on top of a base material to obtain specific properties such as UV-absorption, texture, oxygen permeation resistance, or energy reflection. Extruded tubing, such as PVC pipes, is manufactured using very similar dies as used in blown film extrusion. Positive pressure can be applied to the internal cavities through the pin, or negative pressure can be applied to the outside diameter using a vacuum sizer to ensure correct final dimensions. Additional lumens or holes may be introduced by adding the appropriate inner mandrels to the die. Multi-layer tubing applications are also ever present within the automotive industry, plumbing & heating industry and packaging industry. Over jacketing extrusion allows for the application of an outer layer of plastic onto an existing wire or cable. This is the typical process for insulating wires. There are two different types of die tooling used for coating over a wire, tubing (or jacketing) and pressure. In jacketing tooling, the polymer melt does not touch the inner wire until immediately before the die lips. In pressure tooling, the melt contacts the inner wire long before it reaches the die lips; this is done at a high pressure to ensure good adhesion of the melt. If intimate contact or adhesion is required between the new layer and existing wire, pressure tooling is used. If adhesion is not desired/necessary, jacketing tooling is used instead. In many real-world scenarios, a single polymer cannot meet all the demands of an application. Compound extrusion allows a blended material to be extruded, but coextrusion retains the separate materials as different layers in the extruded product, allowing appropriate placement of materials with differing properties such as oxygen permeability, strength, stiffness, and wear resistance. ^ Rauwendaal, Chris (2001), Polymer Extrusion, 4th ed, Hanser, ISBN 3-446-21774-6 . ^ Todd, Allen & Alting 1994, pp. 223–227. ^ John Vogler (1984). Small Scale Recycling of Plastics. Intermediate Technology Publication. pp. 6–7. ^ Rosato, Marlene G. (2000), Concise encyclopedia of plastics, Springer, p. 245, ISBN 978-0-7923-8496-0 . ^ Giles, Harold F.; Wagner, John R.; Mount, Eldridge M. (2005), Extrusion: the definitive processing guide and handbook, William Andrew, p. 151, ISBN 978-0-8155-1473-2 . ^ Shah, A and Gupta, M (2004). 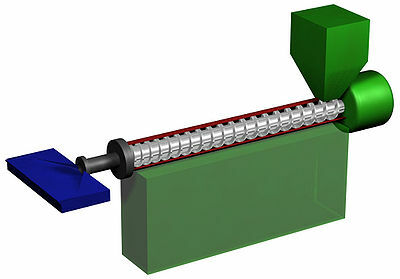 "Comparison of the flow in co-rotating and counter-rotating twin-screw extruders". ANTEC, www.plasticflow.com.